Some might say that Blackjack is the ultimate casino game, conjuring as it does an aura of money, tuxedos, cocktails and of course James Bond. Does it really need altering? Well apparently it does – there are a number of variants out there in online casinos and Blackjack Stand-Or-Bust is an addition to that list. 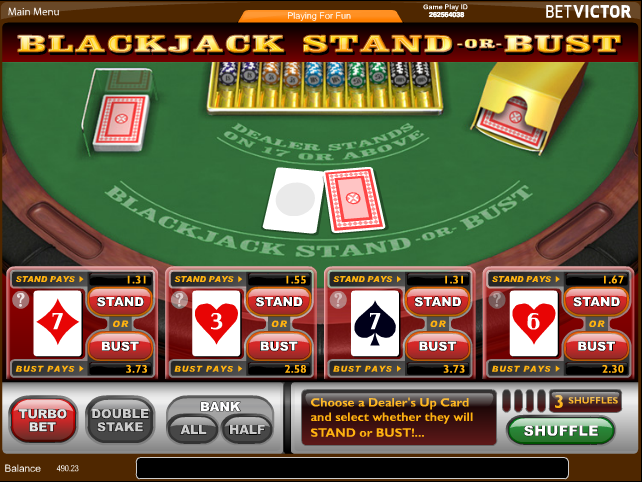 Blackjack Stand-Or-Bust is from Ash Gaming and in fact it’s probably a bit of stretch to call it Blackjack; in this game you are not trying to compete against the dealer, you are trying to predict the turn of a card and betting on the outcome. Even if that sounds a bit like Blackjack, it’s not. The aim of this game is to correctly estimate whether the dealer’s hand will stand or bust. To being with you will be shown four sets of cards and it’s up to you to decide which particular hand you want the dealer to use. Each option displays what your current win will increase to should you be successful. Make your choice depending on your tolerance to risk and the dealer’s hand will then play out. As with standard Blackjack the dealer must stand on 17 or above and of course will bust with a total of over 21. If you win your bet the stake amount plus the win will be carried over automatically into the next bet ready for you to try again. If you don’t want to do this you can choose to bank all or half of that amount and start again. You begin the game with a number of shuffles; if you don’t like the four selections you are given just press shuffle for four new dealer hands. Each successful bet will light up one of the areas next to ‘Shuffle’ – when you have four lights an extra shuffle will be awarded. This is an interesting Blackjack variant and although it only bears a passing resemblance to that game it’s enjoyable nonetheless. It’s easy to pick up and there’s a healthy RTP of 97.00% if you’re using some sensible strategy.